Nissan today took over Dallas' popular Klyde Warren Park to announce a major sponsorship agreement with the city -- along with the debut of the 2017 Nissan Pathfinder, which goes on sale at Nissan dealerships nationwide this fall. The reveal of the new Pathfinder took place inside a pop-up "#FindYourNewPath" urban maze. In attendance during the event were Dallas city and Parks and Recreation officials. "The new Nissan Pathfinder takes the iconic nameplate to an even higher level of performance, technology and style," said José Muñoz, executive vice president, Nissan Motor Co., Ltd. and chairman, Nissan North America, Inc. "The Pathfinder is the perfect vehicle for connecting urban and off-road adventures, just as the Klyde Warren Park is a connection between Downtown and Uptown Dallas." Nissan's Klyde Warren Park sponsorship includes being named a Premier Sponsor, a Presenting Sponsor of key signature events held at the park, sponsor of the park's free Wi-Fi service and the park's official vehicle brand. Dallas is home to Nissan's financial services group, Nissan Motor Acceptance Corporation (NMAC), which employs 1,100 people. Texas also includes 73 Nissan dealerships and their more than 7,000 employees. Texas is the number two state in the U.S. in sales, accounting for more than 10 percent of total new vehicle sales. In addition, Nissan's Texas presence includes 31 outside suppliers supporting the company's North American manufacturing operations and production of nearly one million vehicles in the U.S. in 2015. "Nissan has had a 35-year presence in Texas with a longstanding commitment to supporting activities at the local community level, whether school activities or Habitat for Humanity housing builds," said Muñoz. "We hope that our support of Klyde Warren Park will help enable additional activities and educational opportunities, attracting even more Dallas residents and visitors to this wonderful location." Pathfinder, one of Nissan's best known and most popular nameplates in its nearly 60-year history in the United States, is reborn for the 2017 model year with more adventure capability, a freshened exterior look and enhanced offering of safety and technology features. The changes for the new model year begin with its new 3.5-liter V6, which utilizes more than 56 percent new or new-to-Pathfinder engine parts and components -- including combustion chamber design, pistons, intake manifold, e-VTC and new Direct Injection Gasoline™ (DIG) system. Horsepower for the new V6 engine increases to 284 hp (from the previous 260 hp) and torque is now rated at 259 lb-ft (up from 240 lb-ft). Maximum towing capacity has increased by 1,000 pounds to a best-in-class* 6,000 pounds (when properly equipped). The Pathfinder's refreshed exterior provides a stronger sense of adventure character and presence by adding Nissan signature design elements, such as the new "V-Motion" grille and boomerang-shaped headlights with LED daytime running lights. Other exterior enhancements include new front bumper, fog lights, outside rearview mirrors with integrated turn signals and new 18-inch and 20-inch aluminum-alloy wheel designs. In the rear, changes include new taillight and bumper designs. Another significant addition for 2017 is the available Motion-Activated liftgate with liftgate position memory, which is standard on SL and Platinum grades. A simple wave of the foot under the center of the tailgate activates the power opening function. Pathfinder's stylish, adventure-ready interior includes comfortable seating for seven, enhanced user friendliness and updated connectivity features. For 2017, Pathfinder adopts new-generation information technology. The standard Advanced Drive-Assist™ Display (ADAD), located in the center of the instrument display between the tachometer and speedometer, features additional infotainment and driver assistance displays (versus the 2016 Pathfinder design). The standard 8.0-inch touch-screen monitor, mounted in the middle of the instrument panel, provides intuitive interaction and control of a variety of driver-selectable vehicle systems and settings -- including the available NissanConnect℠ Navigation, which includes Voice Recognition for navigation, including one-shot voice destination entry, and SiriusXM® Traffic® with three years of service included**. Also available are NissanConnect Services powered by SiriusXM®** which features automatic collision notification, emergency call, stolen vehicle locator, customizable alerts, remote engine start/stop through companion app***, dealer service scheduling and maintenance alerts. Available advanced Driver Assistance technology includes new Forward Emergency Braking (FEB) and Intelligent Cruise Control (ICC). For 2017, Moving Object Detection has been added to the available Around View® Monitor (AVM). Also offered are Blind Spot Warning (BSW) and Rear Cross Traffic Alert (RCTA). For photography, full information and specifications of the 2017 Pathfinder and the complete lineup of Nissan vehicles, please visit www.NissanNews.com/2017Pathfinder. *Ward's Segmentation. MY17 Pathfinder vs. in-market 2017 & 2016 Large Cross/Utility Vehicle class competitors. Towing capability varies by configuration. See Nissan Towing Guide and Owner's Manual for proper use. **SiriusXM® subscription required, sold separately (after applicable introductory period). ***State laws may apply; review local laws before using. 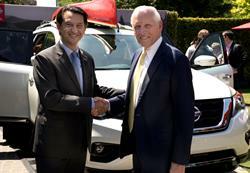 Nissan today took over Dallas' popular Klyde Warren Park to announce a major sponsorship agreement with the city -- along with the debut of the 2017 Nissan Pathfinder, which goes on sale at Nissan dealerships nationwide this fall. 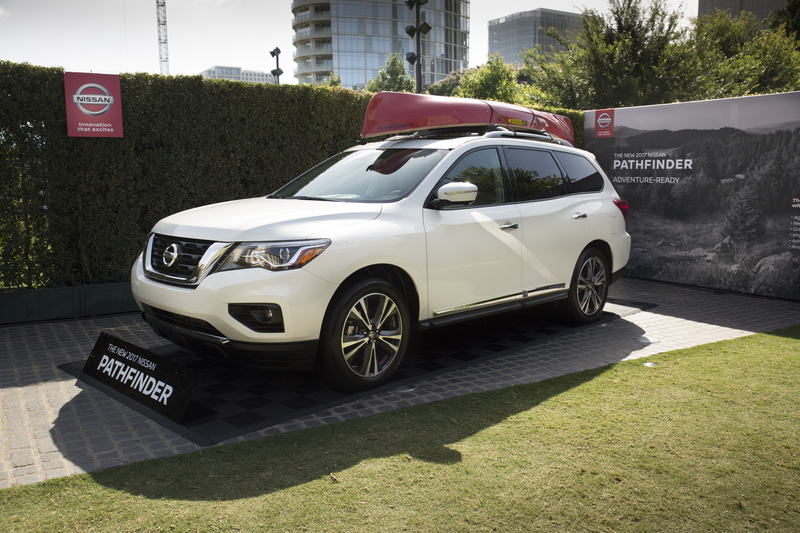 The reveal of the new Pathfinder took place inside a pop-up "#FindYourNewPath" urban maze. In attendance during the event were Dallas city and Parks and Recreation officials. Pictured is José Muñoz, executive vice president, Nissan Motor Co., Ltd. and chairman, Nissan North America, Inc. and Jody Grant, chairman of the Woodall Rodgers Park Foundation.